Media caption"It has become an inland sea"
"We have thousands of people... in roofs and trees waiting for rescue," Ms Haga told AFP news agency. "We are running out of time. People have been waiting for rescue for more than three days now. We can't pick up all the people so our priority is children, pregnant women, injured people." 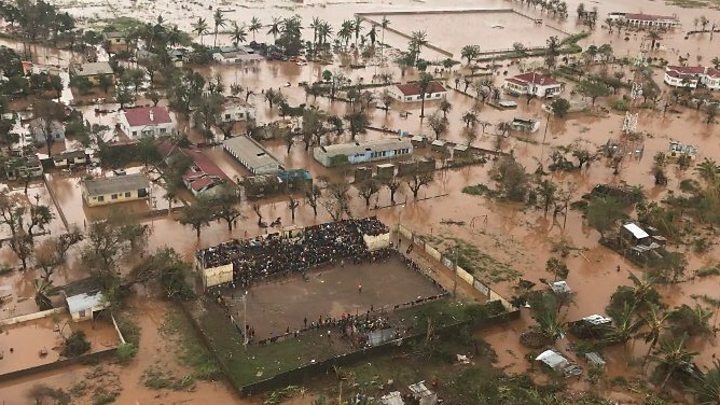 Celso Correia, Mozambique's minister of land and environment, confirmed this, telling Reuters the number of people still needing to be rescued was thought to be about 15,000. "Relief operations are progressing, but there is still a lot of work," she told AFP. In the parts of the city which are near the sea, there is almost nothing left. My house has two floors, and there's basically nothing there now. The roof has given way, and water is coming in from every corner. I was in my house during the storm. I actually didn't have any way of leaving, even if I'd wanted to. All of the roads near the sea, where my house is, were flooded. The wind was so strong it was picking up stones and hurling them around. I saw stones flying, zinc sheets flying, even pieces of cars. The debris smashed all of the windows in my house. I was able to walk around some of the affected areas shortly after the storm. I would say that 75% of the city is totally destroyed. We're still waiting for help. We need food, certainly, and we urgently need construction materials. Videos and pictures have emerged of people queuing - not to collect fuel or bread, but to donate food, clothes and other goods to the relief effort. The BBC's Shingai Nyoka says the country is in the middle of an economic crisis but this has not stopped an unprecedented community aid effort.